ABSTRACTS Report on 3 patients who received unconventional implant treatment because of the presence of impacted teeth. These cases, although limited in number, suggest that implant placement through an impacted tooth might not interfere with implant integration or harm occlusal function, at least in the short term. 1. Patients had to be healthy and able to maintain good hygiene. 2. Implant therapy was indicated. 3. The impacted teeth had to be asymptomatic and free of surrounding pathology. 4. When treatment planning was discussed with the patient, it was explained that extraction might be complex and invasive and would necessitate additional augmentation procedures before implant placement. 5. The patient had to request an alternative that was less invasive and promoted earlier delivery of the implant-supported prosthesis. 6. After of the protocol and its deviation from standard care were explained, the patient had to accept the risk of implant failure. In case of implant failure, traditional treatment with an augmentation procedure was warranted at no additional cost. 7. An informed consent document had to be signed. Patient 1 The first patient (Fig 1) was a 62-yearold woman who sought rehabilitation of the maxilla. Bilaterally, horizontally impacted canines were present in sites intended to host implants (Figs 1a and 1b). Seven Osseotite implants (Biomet/ 3i) were placed. Three osteotomies among them were drilled into the impacted canines (Figs 1c and 1d), and implants were placed as follows: 3.75 311.5 mm at the right canine, 3.75 3 8.5 mm at the left canine, and XP 4/5 3 15 mm at the left first premolar. Fig 1d (left) Postplacement periapical radiograph of the right side. The mesial implant has been placed through the impacted canine. Fig 1e (right) Periapical radiograph of the left side after implant placement. The 2 mesial implants have been placed through the impacted canine. The mesial implant is short (8.5 mm long); it failed after 4 months of healing. Figs 1f and 1g Periapical radiographs following removal of the impacted canine. (left) Right side; (right) left side. A 31-year-old woman (Fig 2) who sought replacement of her lost primary canine (Fig 2a) showed the presence of an impacted canine (Fig 2b). The patient refused both orthodontic treatment and invasive extraction of the impacted canine with subsequent implant placement after 6 months of healing. An alternative noninvasive treatment was therefore proposed. Drilling through the crown of the impacted canine was performed with a 3.25-mm squad drill (Fig 2c), followed by 4-mm and 5-mm squad drills (Fig 2d), following the traditional drilling sequence. A 6-mm squad drill was used in only the coronal half of the osteotomy to prevent the implant from contacting the root of the canine. The implant was placed (Fig 2e). Primary stability was achieved through the apical portion of the implant, which was not drilled with the 6-mm drill. An Osseotite NT 5 315-mm implant was placed, with a bone defect remaining on the palatal side of the implant. The defect was filled with Bio-Oss (Geistlich) and the implant was left to heal in a submerged fashion for 6 months. Fig 2a Patient 2. Facial view before implant treatment. The primary canine was lost, and the patient had been wearing a removable appliance for 2 months. Fig 2b Radiograph of the impacted right canine before implant treatment. Fig 2d Periapical radiograph following removal of the drills. Fig 2e Periapical radiograph after implant placement. Note the space left on the mesial side of the implant after removal of the crown. Fig 2f Clinical view of the rehabilitated canine at the 4-year recall. Stability of the gingival margin and the papillae has been maintained. Fig 2g Periapical radiograph obtained at the 4-year recall. Bone has filled the previously empty space corresponding to the crown of the canine. Because of platform switching, the bone level was maintained coronal to the level of the first implant thread. No abnormal bone response or root resorption was noticed. An 80-year-old man who sought a global prosthetic solution in the mandible (Fig 3) showed a horizontally impacted left premolar (Fig 3a) that was classified as level C.5 The patient refused invasive surgery of the impacted tooth and a protracted healing period prior to implant placement. Seven implants were inserted; 3 were placed in contact with the impacted premolar. At the left first premolar site, an Osseotite Certain 4/5 3 13-mm implant had its apical extremity left in contact with bone (Figs 3b and 3c). At the left first canine site, an Osseotite NT 5 3 11.5-mm implant had its apical extremity remaining within the limits of the crown of the impacted premolar (Figs 3b and 3d). At the left lateral incisor site, the placed Osseotite NT 4 313-mm implant was in contact with the coronal part of the crown on its distal side only (Figs 3b and 3c). The drilling sequence was not altered, and close tooth-implant contact was sought to ensure primary stability. Implants were evaluated clinically and radiographically at the end of the healing period, at 6 months, and at an annual recall. The success criteria were applied according to Buser et al15 and Cochran et al.16 Clinical criteria for success included (1) absence of clinically detectable implant mobility, (2) absence of pain or any subjective sensation, and (3) absence of recurrent peri-implant infection. Radiographic success, as judged according to periapical images, included (1) absence of continuous radiolucency around the implant, (2) observation of any abnormal reaction at the bone-implant interface, (3) observation of any specific reaction at the root-implant interface, (4) determination of resorption of the remaining root fragment. Fig 3a Patient 3. Panoramic sections of a computerized tomographic (CT) scan showing the orientation of the impacted premolar. Fig 3b Radiograph of the implants placed through the impacted right premolar after placement of the definitive prosthesis. The implant in the right canine site crossed over the root, while the implant in the lateral incisor site did not. The implant in the central incisor position is only in contact with the coronal part of the crown on its distal side. Fig 3c Panoramic section of the CT scan at the 2-year recall. The section confirms that one implant’s apex is in contact with bone, while the other is not. No abnormal bone reaction or root resorption could be detected. Fig 3d Oblique section of the CT scan at the 2-year control confirming the impacted tooth-implant relationship. No abnormal reaction was seen at any implant, whether placed in bone or through the impacted tooth. Of the 3 implants placed through the impacted canines, the 8.5-mm-long implant placed in the region of the right canine became mobile after 4 months and was removed. This failure was caused, most likely, by the fact that the implant was not placed deep enough into the impacted canine (Fig 1d); the other 2 implants healed uneventfully. After 6 months, the impacted teeth were removed from around the integrated implants through a palatal approach. A bone substitute (Bio-Oss, Geistlich) was placed around the implants to fill the remaining bone defects. Immediately afterward, a provisional prosthesis was placed over the 6 osseointegrated implants, and 4 additional implants were placed into fresh extraction sockets (Figs 1e and 1f). The patient received the definitive prosthesis after 6 months; at the 4-year recall, all implants were stable and no deleterious events were recorded. The patient did not report any postoperative pain after the crown was separated from the root (Figs 2c to 2e). Submerged healing was uneventful; after 6 months, a healing abutment with platform switching was placed. Figures 2f and 2g show the clinical and radiographic situation at the 4-year recall. Bone filled the space previously occupied by the crown; close to the root, a material of lesser density, probably bone, was observed at the implant interface (Fig 2g). On the periapical radiograph, no abnormal features such as bone or dentin resorption were observed. The single crown was clinically immobile and the levels of the marginal gingiva and the papillae were stable (Fig 2f). In various animal experiments18,19,21,22 it has been shown that periodontal ligament (PDL) cells can compete with local osteogenic cells and form a PDL structure at the implant surface, up to a distance of several millimeters from the original PDL. Therefore, it is possible that the small gap left between the implant and the impacted canine in patient 2 has been colonized, at least partially, by a newly formed ligament that has been in function for 3.5 years. In patient 3, this structure is likely to be absent because of the intimate contact deliberately maintained between the dentin and the implant during implant placement. Surprisingly, no patients complained about postoperative pain after penetration into the pulp chamber. There is no clear explanation for this, but a conjecture for this can be developed. Pulp pain or necrosis usually originates from infection23 or nerve compression. In the present patients, large openings were created through the pulp and copious bleeding was allowed during surgery. The section of the pulp that was drilled was at the coronal part of the teeth. This could have left a viable apical pulp, similar to what is obtained during partial pulpotomy24 or vital root retention.25–27 Warrer et al19 explicitly reported that the pulp of drilled roots left in contact with implants appeared normal after 3 months of healing in the monkey. Because surgery is performed under sterile conditions and the impacted roots usually remain away from contamination from the oral cavity, bacterial contamination and subsequent infection can be more easily prevented. This would be in line with Sabeti et al,28 who reported that when contamination is circumvented, periapical complications and root obturation can be avoided following endodontic treatment. In conclusion, implant placement through an impacted tooth was helpful as an alternative approach to invasive surgical extraction. In these 3 patients, one 8.5-mm short implant failed after 4 months, but the 6 other implants that were placed through impacted teeth integrated successfully. One and 3 implants have been functioning successfully for 3.5 and 2 years, respectively. Radiographically, the bone-implant interface was similar to the interface of implants placed in contact with bone only. 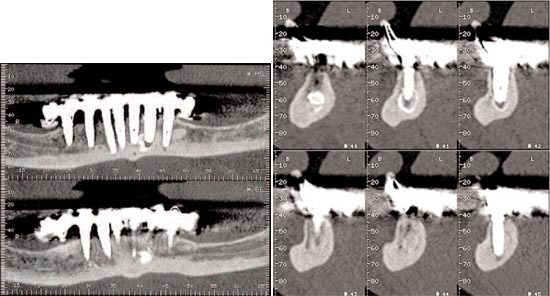 More cases are warranted to document this type of unconventional implant placement, but the technique remains an intriguing possibility for simplified treatment in the presence of impacted teeth. Head, Department of Odontology, and Head, Rehabilitation Center, American Hospital of Paris, France; Private Practice, Paris, France. Associate Professor, Department of Stomatology and Maxillofacial Surgery, University Paris 6, Paris, France; Visiting Professor, Department of Odontology, Galeazzi Orthopaedic Institute, University of Milan, Italy. The authors wish to thank Aurélie Nesseir and Dr Nedjoua Ouada-Cappelle for their helpful and efficient patient follow-up. Evelyne, Sabrina, and Nadia are also acknowledged for their daily assistance.